We are very pleased to announce that Glenna Sloan is joining us as a byline correspondent. Glenna teaches at Queens College, CUNY. 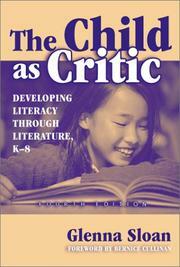 She is the author of (among other works) The Child as Critic: Developing Literacy Through Literature, K-8. Check out her website here. You can read her paper, “Northrop Frye in the Elementary Classroom,” here. This entry was posted in News on December 29, 2009 by Michael Happy. Welcome, Glenna! I look forward to your posts. I remember how much I appreciated hearing your contribution at the 2007 symposium in Ottawa.